Upcoming Games: The Return of SmashClix!! Just another quick game announcement for local SE Michigan ‘Clixers! 6/1/2016: The Return of SmashClix!! Army Construction: Each player brings up to THREE Golden Age teams. 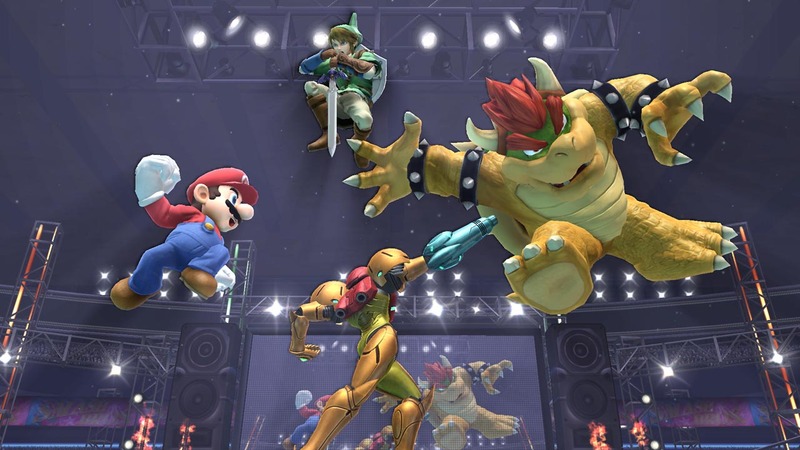 Each team MUST consist of THREE characters of 150 points each or less. Only one team will be used in any particular round. We may play up to three 40 minute rounds. No figure bigger that a peanut base. No Colossal Size figures or team bases. Any figures with special powers that put out bystanders, other figures, special markers, or terrain markers. Examples include: Captain Cold and his hindering terrain markers, Sea King and his water terrain markers, Monsieur Mallah and the Brain, or WS007 Spider-Man and his web special terrain markers. Figures with smoke cloud or barrier are fine. The following characters are banned: NFAOS056 Nick Fury, WKD-027 Felix Faust, WKM-028 Doctor Strange, WF041 Mary Marvel, SLOSH039 Bizarro, AAOU005 Thor. Please note that we will not be including standard objects in the game. To compensate for that, figures that can use super strength deal +1 damage in close combat attacks. How to Play: SmashClix is a Battle Royal variant with up to six players competing on the same map. A map will be provided by the judge with additional starting zones added for all players. Before each round, you must choose which of your three teams you are going to play for that round. For each team of three characters, you must also assign an order of play to each character. The character you designate as Character 1 will start the game; Character 2 will come into play in your Starting Zone if and when Character 1 is KO’d. Character 3 will come into play in your Starting Zone if and when Character 2 is KO’d. And Character 1 will re-enter the game in your Starting Zone if and when Character 3 is KO’d, and so on, until the game ends. When a player’s character is KO’d, his next character gains “First Turn Immunity” when it comes into play. Once everyone has selected a team AND a team order, forces are revealed and all players roll 2d6 to determine which player goes first. Note that you may choose a different team for each round if you wish. Each player’s turn is limited to 60 seconds or less. The judge may move play to the next player immediately if a player’s turn lasts more than one minute. You can score points by KOing opposing characters on your turn (or rarely by finding a heart container). Every opposing character that is KOed on your turn (by an attack or any other affect) adds one to your overall score. However, whenever you are KOed (whether or not it’s your turn) you subtract one from your overall score. For example, If you KO three characters during a round and you are KOed twice then your overall score for that round is +1. High Score Wins. 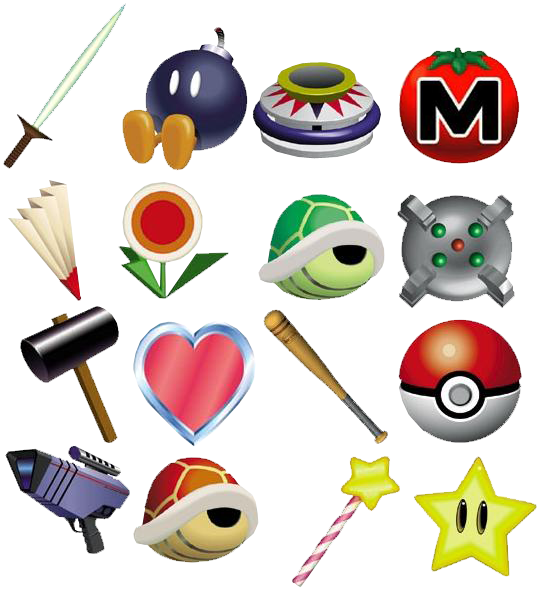 3 – Bob-Omb – Immediate Effect – You and any other figures within 2 spaces are immediately dealt 2 unavoidable damage. 4 – Hammer – Equipment – While equipped your character has: -3 speed, Earthbound, and Improved Movement: Ignores Characters. The equipped character may use quake as a free action with a locked damage value of 4. Knock back caused by this use of quake is unavoidable and if damage is incurred from the knock back, that damage can’t be reduced below one. You may not make any other attacks besides the free action quake. 5 – Beam Blade – Equipment – Equipped character can use Blades/Claws/Fangs and Exploit Weakness. Attacks by the equipped character cause unavoidable knock back and if damage is incurred from the knock back, that damage can’t be reduced below one. 6 – Super Mushroom – Equipment – Equipped character gains the Colossal Size symbol (including giant reach 3), and they can use Close Combat Expert. Attacks by the equipped character cause unavoidable knock back and if damage is incurred from the knock back, that damage can’t be reduced below one. 7 – Warp Star- Immediate Effect – You may immediately move to any square on the board. 8 – Fire Flower – Equipment – Equipped character ignores battle fury (if they have it), Range is locked at 8, they can use Energy Explosion, and they deal damage with Energy Explosion as if they had three printed bolts. Attacks by the equipped character cause unavoidable knock back and if damage is incurred from the knock back, that damage can’t be reduced below one. 9 – Light Gun – Equipment – Equipped character ignores battle fury (if they have it), Range is locked at 8, and they can use Ranged Combat Expert. Attacks by the equipped character cause unavoidable knock back and if damage is incurred from the knock back, that damage can’t be reduced below one. 10 – Screw Attack – Equipment – Equipped character can use Hypersonic Speed. Attacks by the equipped character cause unavoidable knock back and if damage is incurred from the knock back, that damage can’t be reduced below one. 11 – Blue Shell – Immediate Effect – Choose an opposing figure. That figure and any other figures within 2 spaces are immediately dealt 2 unavoidable damage. 12 – Heart Container – Immediate Effect – Immediately add +1 to you overall score. You don’t have to roll on the Equipment and Immediate Effects table if you don’t want to. You can skip that step. Immediate Effects are not optional. Equipment you roll on to is immediately equipped to your character without any extra actions needed. You may only have one piece of Equipment equipped at a time. If you roll a new piece of Equipment on the Equipment and Immediate Effects table you may choose to use that Equipment OR you may choose to keep using the equipment that you already have (or you can use nothing if you have nothing to start). You may not “drop” equipment, but you may replace it with a different piece of equipment by rolling on the Equipment and Immediate Effects table at the start of your next turn. If you are KOed you lose any Equipment you had.